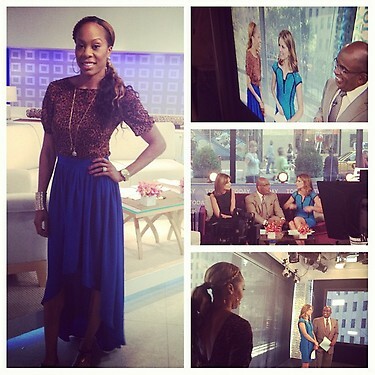 I loved meeting Sanya Richards Ross not just because she is a gold medalist and an amazing athlete she was just so kind and so nice and really it just was so rewarding to meet her- she has recently rocked several outfits we pulled for her – here she is rocking her TUCKER leopard top and Synderla blue skirt – She looks so chic ! She was on THE TODAY SHOW today and it was so cool she rocked these two NY MADE designers ! !